A tireless and community-conscious advocate, Valerie M. Cartright is a Senior Associate at the Law Offices of Frederick K. Brewington. Throughout her legal career, Ms. Cartright has gained invaluable legal experience as a litigator which sets her above and apart from her peers. Ms. Cartright started her legal career in the areas of construction law, insurance defense, and general civil law. Since that time, she has broadened her exposure through practice in various areas, which include but is not limited to civil rights, family, criminal, education and labor and employment law. Her affiliation with the Law Offices of Frederick K. Brewington has allowed her to make large-scale impacts on the community while serving to preserve the civil rights and liberties of those individuals whose rights have been violated. One of the most fulfilling areas that she has worked in is the area of Voter Protection, wherein, through her office, she commenced litigation to uphold the Voting Rights Act and worked diligently to prevent unconstitutional and discriminatory denial of voters on Long Island. Ms. Cartright's efforts to protect the rights of voters is not limited to the courtroom. On election days, Valerie visits various communities on Long Island and serves as a legal tool to people in the community, working hand-in-hand with individuals who believe that their right to vote has been violated. Ms. Cartright received her Juris Doctorate from Touro College Jacob D. Fuschberg Law Center in Suffolk County, after receiving her undergraduate degree in International Studies from West Virginia University. During her law school career, she availed herself of numerous opportunities to exhibit her leadership abilities and, in turn, earned numerous awards for academic excellence, contributions and service to the community. In addition to serving as a law school Judicial Clerk at the United States District Court for the Eastern District of New York and studying abroad in Paris, France, she served as a Research Assistant at ERASE Racism, a Long Island not-for-profit organization promoting policies and programs to address institutional and structural racism and increase racial equity in public school education, housing and healthcare; an organization for which she served as a Board Member for numerous years, and remains a Partner. 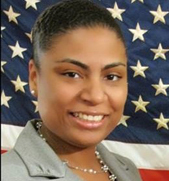 Ms. Cartright's advocacy skills have warranted her a First Place Award and Best Oralist Award in Touro Law School's John S. Bainbridge Moot Court Competition, as well as being named a Regional Finalist of the National Black Law Students' Association Frederick Douglass Moot Court Competition. Ms. Cartright remains steadfast in her commitment to mentoring and coaching law students who participate in various oral advocacy competitions. She was recently recognized as an Alumni Honoree by the Black Law Students Association of Touro Law Center as well as named the "2008 Public Service Attorney of the Year". She also received the Alumni of the Month (May 2012) by Touro Law Center for her service to the community. Ms. Cartright has also shown great interest in assisting newer lawyers to bridge the gap from law school to a law career. She served as the first African-American Chair of the largest section of the New York State Bar Association, the Young Lawyers Section, comprising of more than 3,200 members, including law students, newly admitted and younger attorneys. While serving as Chair of the Section, she published an article in the New York Law Journal entitled "The Integrity of the American Justice System". In addition to practicing law, Ms. Cartright presently serves as an Adjunct Instructor at St. Joseph's College in the Human Services Management and Leadership Master's Program, teaching a "Leadership, Law and Ethics" course. Ms. Cartright is a member of various organizations, which includes the National Coalition of 100 Black Women- Suffolk County Chapter, National Bar Association and the New York State Bar Association. On occasion, she serves as a Panelist or Guest Lecturer for Bar Association events speaking on various legal issues and at various community organization events speaking on community issues. Last year, Ms. Cartright was recognized and honored by the Brookhaven Democratic Committee's Women's Caucus for her service to the community. Ms. Cartright is the current President of Amistad Long Island Black Bar Association and the former Chairperson of the Civil Rights Committee of the Nassau County Bar Association. In addition to holding office in the local chapter of her sorority, Zeta Phi Beta Sorority, Incorporated, Ms. Cartright plays an integral role in molding the young minds of leaders of today and tomorrow through various mentoring commitments and through her service as former Chairperson and current Vice-Chairperson of Project Hope -The New Direction, a not-for-profit organization providing recreational, social and educational activities to underprivileged children in the Southeast Queens (NY) area. She is the former Trustee of the Rosa Parks Democratic Association and was recently recognized and honored by the Brookhaven Democratic Committee's Women's Caucus for her service to the community. Ms. Cartright is not only passionate about the law, justice and her community, but exhibits her passion for God through her service over the years as a Ministry Director and member of various ministries, including the step, liturgical dance and drama ministries, as a part of her Christian faith. She continues to do the same in her current faith community Valerie's devotion to worship via the arts began after a sincere yearning to be a living testimony of favor, grace and mercy in her life. A breast cancer survivor of five years, Ms. Cartright is an advocate for early detection and screening, and promotes equal access to services for all women regardless of social or economic status. She is active fundraiser for the American Cancer Society for breast cancer research and early detection. Ms. Cartright is of Haitian descent and speaks proficient French and Creole (Kreyol). She is a resident of Port Jefferson Station, a place in which she proudly calls her home.